Recently, we were contacted by Forest Lawn Memorial Park & Mortuary because they were in need of some graphics. Forest Lawn is a long-time customer of ours so we’ve done many different types of signs for them in the past. This time around, they were getting a kiosk at The Shops at Montebello, an indoor mall in Montebello, California. Kiosks are very common in both indoor and outdoor malls, and it’s common to see a line of them in the middle of the large walkways. Some are pretty basic and plain, and it’s very easy to ignore a kiosk if it doesn’t stand out from the others. 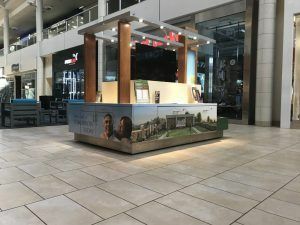 Forest Lawn wanted to make sure that their kiosk stood out so they had us create some graphics to wrap around the base of the kiosk, along with two prints that were going to be backlit. When creating digital prints, we only use name brand vinyl that we have a lot of experience using. Our goal is to create custom signs that are long-lasting and look great. We also have a large format printer that can print up to 52″ so we can create large prints without any seams. Sometimes, seams are inevitable if we’re making a very large sign, but we like to avoid them when we can. Digital prints are great because they’re completely customizable. As long as we have artwork in vector or pictures that are high enough resolution, we can create large prints that look great. We can apply vinyl to windows, walls, or a backer panel that can be mounted onto the wall or furniture. We can also wrap some furniture depending on what it is like, this mall kiosk. The kiosk looks great and is sure to receive a lot of impression from the mall patrons. Give us a call if you’re in need of some custom, large prints for your business!